Bruce Nordstrom remembers his first job with the family business as if it were yesterday. He was 9 years old, World War II had just begun and Nordstrom was working in the stockroom at one of the retailer's two shoe stores for 25 cents an hour. "In those days, that wasn't bad money," Nordstrom remembers. The young entrepreneur's pride was soon wounded when he overheard secretaries mentioning that his father, Everett, '23, had paid Bruce's $7 weekly salary out of his own pocket, maintaining that his son "wasn't worth 25 cents an hour." Nordstrom, who graduated from the University of Washington in 1955 with a bachelor's degree in economics, has never forgotten the incident. But there is no doubt he proved his worth to the family clan, becoming a key figure in transforming a regional shoe chain into one of the most successful and respected specialty fashion retailers in the nation. Helping to maintain one of America's most famous corporate cultures, Bruce Nordstrom has preached placing employees ahead of managers, focusing on customer service and empowering workers to go that extra mile. The result has been nothing less than a retail revolution. From 1963, when Bruce Nordstrom became company president, till 2006, when he retired for the second time from daily responsibilities, the retailer grew from seven shoe stores in the Pacific Northwest to 156 fashion outlets in 27 states, as well as a chain of fashion boutiques in Europe. During those four decades, sales grew from less than $40 million to $8.6 billion. However, the numbers explain only a part of Bruce Nordstrom's accomplishments. While always modest about his deeds, Nordstrom has also been a force in civic activities, a leader in charitable giving and devoted alum to the University of Washington. "Bruce, to me, epitomizes what the Nordstroms are all about," says Robert Spector, author of The Nordstrom Way, and a recognized expert on the company. "He is modest, self-effacing, hardworking on the one hand and extremely competitive on the other hand." Because of his unparalleled success in business, concern for the local community and dedication to his alma mater, Bruce Nordstrom has been named the University of Washington's 2010 Alumnus Summa Laude Dignatus—the "alumnus worthy of the highest praise." He is the 70th recipient of this honor, which is the foremost award that the UW can confer upon a graduate. Nordstrom's innate drive was obvious from the start. By 14, he was selling shoes on the store's main floor. Sixteen years later, he was company president and helped the retailer merge women's clothing with its shoe business. 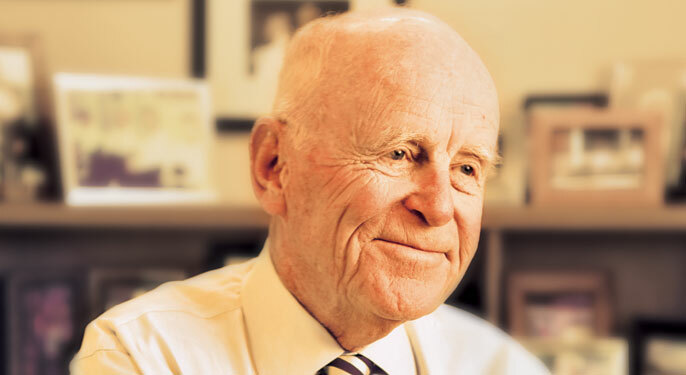 During the next three decades, Bruce, his two cousins, John, '59, and Jim Nordstrom, and cousin-in-law Jack McMillan, '57, led the company to unprecedented heights. Ironically, the retailer's success was built, in part, on breaking just about every business rule in the book, including its style of managing by committee. Business experts continue to marvel at how the company has succeeded with this unorthodox structure. Bruce Nordstrom says the secret was that family members running the company in each generation have shared a deep respect for one another and have always worked as hard as they could. That tradition continues to this day with Nordstrom's three sons, Blake, Erik, '85, and Peter, '85, now running the company. The Nordstrom family has also always shared a deep respect for the UW. During the past nine decades, nearly every family member holding a management position in the company has graduated from the university. While he shies away from talking about his own activities, Nordstrom has long been a friend and adviser to UW presidents and among the university's most generous donors. He also has been generous with his time, lecturing budding entrepreneurs at the Foster School of Business and giving an occasional talk at his former fraternity, Beta Theta Pi. One of the Nordstrom family's great loves has been UW sports. Bruce is carrying on the tradition by staying very active in programs to raise money to support the school's athletics programs. He is the former chairman of the Tyee Board of Advisors and, in 1994, was the first recipient of the Frank Orrico Award for his "uncommon dedication" to the Department of Athletics. He is also a 50-year season ticket-holder for both basketball and football. UW President Mark Emmert says one of the joys of his position is to get to know people like Bruce Nordstrom. Emmert is most impressed by Nordstrom's ability to raise three sons who are able to carry on the unique family culture that has made the Nordstrom Company so special. "He has been able to raise his boys to have the same values, same commitment to the community and focus on doing things the right way," Emmert says. "The notion of the �Nordstrom Way' isn't just about business. It is how Bruce lives his life and treats others." —Freelance writer Jeff Bond's last story for Columns was about the anthropology of garbage.